After his initial setbacks and successes, mainly against Bijapur, Shivaji now faced the assembled forces of the mighty Mughal empire, under the command of Shaista Khan, who were already entering his territory and were no doubt causing chaos along the way. While Shivaji was resisting Siddi Jauhar of Bijapur, Shaista Khan was approaching the Deccan with his huge army. He reached Aurangabad in January 1660, before marching further to Ahmednagar, so that he could encamp at a deserted mud fort in Supa (on 25 February). Then he left for another dilapidated fort at Baramati (arriving on 5 April), and another fort at Nira (all the while deputing officers to administer those areas), and finally arrived at Shirwal (18 April). His lieutenants wreaked havoc on the villages near Shirval. The Marathas tried to attack the Mughal camp, but were repelled. Shaista Khan then advanced to Puna (present day Pune), on 9 May. He lodged inside the 'Lal Mahal', where Shivaji had spent his childhood. He further instructed his men to lay siege to Chakan, near Puna. Large artillery pieces and a force of twenty thousand men were used by the Mughals in this siege. In spite of the odd numbers, the fort of Chakan was heroically defended by Firangoji Narsala with a small force of three hundred odd men for fifty six days, before it fell to Mughal cannon fire on 15 August 1660. It has to be remembered that with the treaty of August 1657, Bijapur had surrendered Konkan to the Mughals. But Shivaji had captured and held on to those domains from Kalyan, Bhiwandi and Chaul. Shaista Khan wished to have those regions back, so he despatched several Mughal officers to wrest back Konkan. Kalyan, Bhiwandi and some regions in northern Konkan fell to the Mughals. At the end of 1660, Kartalab Khan was equipped with a considerable force of approximately 20,000, and he descended the Ghats near Lonavala. Shivaji was already waiting there with his thousand odd men, and he allowed his opponent to enter the thick forest through the pass which was known as 'Umber Khind' (named after the nearby village of Umber). In spite of the disproportionate numbers, the Marathas led by Shivaji ambushed the Mughals at this strategic point, making Kartalab Khan and his twenty thousand men feel trapped. Kartalab Khan begged Shivaji for safe passage, which he was given , but only after he also handed over a large ransom. Now, Shivaji divided his forces in two. One force, led by Netaji Palkar, was to engage the Mughals. The other, led by Shivaji, marched south to the Konkan territory of Adilshah. Shivaji's advance was spectacular. 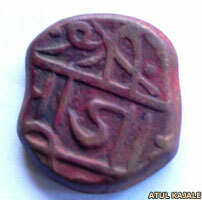 Dabhol, Pali, Sangameshwar, Chiplun, and Rajapur all fell into his hands and yielded considerable wealth. Shirngarpur fell on 29 April 1661, and Shivaji spent the summer of 1661 on Wardhangad in Konkan. In 1661, Maharaja Jaswant Singh of Jodhpur and Jaffar Khan of Malwa were also instructed to enter the Deccan to assist Shaista Khan in his campaign against Shivaji. In 1662, the Mughals didn't have much success in capturing any Maratha forts, and the Marathas avoided pitched battles with the Mughals, so Shaista Khan followed a policy of torching the villages below any forts. A Mughal officer, Namdarkhan, and others attacked villages between Lohagad, Visapur, and Tung and Tikona. They set alight seventy eight villages, looting and destroying grain and property. He harassed the villagers no end, killing several and taking many as prisoners. This took place over the course of two long years, and Shivaji relocated many of his villagers, often transferring families to the security of his forts to keep them safe. Shaista Khan was the brother of Mumtaz Mahal (wife of Shah Jehan) and nephew of Nur Jehan (wife of Jehangir). He had also been a part of the Deccan mission sent by Shah Jehan to subdue Shahaji raje Bhosale (father of Shivaji). Meanwhile, after three years of campaigning, Shaista Khan had become a little complacent. He had retired with his harem to his base in Puna. On 5 April 1663, Shivaji did the unthinkable. Along with a band of selected men, he personally launched a commando-like operation right into the heart of the enemy camp. He attacked the very residence in Puna where Shaista Khan was residing with his family and men. Shaista Khan barely managed to escape with his life (although unconscious, he was taken to safety by his maids), losing in the process his thumb and two fingers, which Shivaji himself severed before Khan could take flight. Shaista Khan's son, Abul Fateh, was killed and so were several people from his entourage. The wounded Shaista Khan retreated to the Mughal base of Aurangabad. The ignominy suffered by Shaista Khan created a dampening of spirits in the Mughal ranks. Maharaja Jaswant Singh, who was left in place of Shaista Khan, tried to elevate the mood in the Mughal camp through a siege of Fort Sinhagad (Kondana), but this too turned out to be an abortive effort. On 5 January 1664, Shivaji further added salt to Mughal wounds when he sacked Surat, a rich and prosperous Mughal port, in order to compensate himself for his losses. Its governor, Inayat Khan, proved to be so incompetent that he hid in his fort while Shivaji and his men looted the port in glee abandon for three whole weeks. Adil Shah then sent Aziz Khan to counter Shivaji at Kudal. Shivaji's resident, Raoji Pandit had to retreat to Rajapur in May 1664, but the unexpected death of Aziz Khan in July forced Adil Shah to send a replacement in the form of Khawas Khan (son of the ex-wazir, Khan Muhammed, and also the son-in-law of Rustam e Zaman). Shivaji's kin, Baji Ghorpade of Mudhol, was also asked to assist Khawas Khan. But before he could join the khan, Shivaji attacked him at Mudhol. Baji Ghorpade was fatally wounded in that battle and succumbed to his injuries. Seeing all help cut off, Khawas Khan fled in December. His other commanders, Lakhm Sawant, Desai Keshav Naik, and Keshav Prabhu of Pedhne, along with Khalu Shenvi of Dicholi, also fled into the Portuguese territory of Goa. To his credit Shaista Khan did a good job in Bengal, building a formidable navy, wresting Sandwip island, Chittagong, from the Arakanese (a Burmese kingdom) and later reasserting Mughal control over Kamarup (Assam) and Cooch Behar. He also added greatly to the development of Dhaka (in present day Bangladesh). It is also to be remembered that Shaista Khan was a part of the army that Shah Jehan had sent to subdue Shivaji's father, Shahaji raje, when he was acting as the regent of the Nizamshahi sultanate. Shahaji raje , the father of Shivaji, died on 23 January 1664 in Karnatak, after a fall from his horse. On 5 December 1664, Shivaji laid the foundation of Fort Sindhudurg in the Malwan region along the Konkan coast. He also strengthened his other naval forts at Vijaydurg (Gheria) and Suvarnadurg. While Shivaji's troops were raiding the Bijapur towns of Hubli and Khanapur, Shivaji launched a naval expedition against the prosperous town of Basrur (the Bidnur province of Kanara coast) in February 1665. He plundered the rich town and carried off a large amount of booty. Whatever losses Shivaji suffered during the Bijapur and Mughal onslaughts, he was able to compensate them with the booty he recovered from Surat and Basrur. This time Aurangzeb sent one of his most trusted generals, Mirza Raje Jaisingh, the raja of Amber, with a huge army to subdue the Deccan. Raje Jaisingh was a seasoned military commander. He didn't underestimate Shivaji and devised a multi-pronged approach to subdue him. He isolated Shivaji. First, he consolidated the Mughal bases on the plains; Kalyan, and Bhiwandi. Then he isolated Shivaji by engaging Adilshah and the Portuguese in treaties, whereby they would neither directly nor indirectly assist Shivaji or divert his attention by attacking the Mughals, nor allow safe passage for Shivaji through their territories (though Adilshah was Shivaji's enemy, he could have teamed up with Shivaji to ward off a Mughal attack into the Deccan). He bribed some of Shivaji's men and induced them to switch sides. Jaisingh also invited the Siddis of Janjira to assist him in his endeavours against Shivaji. Also assisting Jaisingh was another stalwart from the Mughal camp, Diler Khan the Pathan, and seasoned warriors who included Jaisingh's son, Kirat Singh, plus Qabad Khan, Mitrasen, Indraman Bundela, Raja Raisingh Rathore, Badal Bakhtiyar, Udaibhan and Haribhan Gaur, Syed Munawarkhan Barha, Sharzakhan, Hassankhan, Jauharkhan, Jagatsingh, Ram Singh, Muhammed Saleh Tarkhan, Raja Narsingh Gaur, Syed Maqbool Alam, Karan Rathore, Hussain Daudzai, Jagat Singh Narwari, Rasul Beg Rozwani, Chaturbhuj Chauhan, Qutubbuddin Khan, Amarsingh Chandrawat, Syed Zainulabbuddin Bukhari, Achal Singh Kachwaha, Qubadkhan, Abul Qasim, Abdullah, Ranadullah, Khwaja Abul Makrim, Raji Afzal Bijapuri, Bhai Afzal Bijapuri, Rasulbeg Rozbhani, Purdilkhan, Shubhkaran Bundela, Bhupat Singh, Zabardastkhan, Atishkhan, Turkataz Khan and Daud Khan, and more. There were many Muslims amongst Shivaji's forces: Siddi Hillal (chief of cavalry), Siddi Wahawaha (cavalry), Noorkhan Baig (first sarnobat), Madari Mehtar (bodyguard, especially during Shivaji's Agra visit), Kazi Haider Kohari (secretary), Shama Khan (sardar), Siddi Ambar Wahad, Hussain Faan Miyana (officer), Darya Sarang/Ibrahim Khan/Siddi Sambal (who was previously part of the Siddis of Janjira but later shifted loyalties to Shivaji/Siddi Misri (nephew of Siddi Sambal)/Sultan Khan/Daud Khan (navy officer), Daulat Khan (admiral), seven cavalry regiments, 700 Pathans, besides many Muslims in the Maratha navy. This should prove that Shivaji wasn't just a leader of Hindus only but had followers from all religions and regions (including Abyssinians like the Siddis, the Portuguese and the English). This massive Mughal army swarmed down into Maratha territory capturing Fort Rudramal (on 14 April 1665), and Fort Kunwari (30 April), and simultaneously wreaking havoc on the villages below Shivaji's various forts such as Rajgad, Lohagad, etc. A siege was also mounted at Fort Purander. Murarbaji Deshpande, a Maratha commander, displayed exemplary courage during this siege, thwarting Mughal attempts to surmount the fort's defences. He even spurned Mughal overtures and sacrificed his life, gallantly defending the fort. By now, Shivaji had realised this was not an enemy he could simply wish away, and thought it prudent to announce a surrender rather than risk further destruction to his forts and his people. He handed over Fort Purander along with twenty two other forts to the Mughals on 11 June 1665 as per the agreement now known as the Treaty of Purandar. Shivaji was also to become a Mughal vassal and assist them in conquering the south, starting with Bijapur. Shivaji was allowed to retain twelve forts, namely Rajgad, Torna, Hingangad, Bhorap, Talegad, Mahagad, Ghosala, Birwadi, Pali, Rairi, Kunwarigad and Udaid. What followed was Shivaji's brief and reluctant affair with the Mughals. Shivaji had to spend almost three months in the Mughal camp, fighting alongside them against Bijapur. Shivaji's general Netaji was sent to reduce Phaltan, which was under Shivaji's brother-in-law, Bajaji Nimbalkar. On 7 December 1665, Nimbalkar surrendered the Adilshahi fort to Netaji. Shivaji had meanwhile captured Tathawda near Phaltan. Netaji again added Mangalvedha to the Mughal kitty on 19 December. Soon Khatav was also captured. Meanwhile, a strong contingent from Bijapur was sent to repulse the Mughal attack (25 December 1665). It included the wazir, Abul Muhammed, plus Sharza Khan Mehdvi, Khawaskhan, Kalyanrao Jadhav, Yaqut Habshi, Ikhlas Khan, Bahlol Khan, Aziz, Siddi Masud (son-in-law of Siddi Jauhar), Abdul Aziz (son of Siddi Jauhar), Rustam Zaman (son of Ranadaullah Khan), and Vyankoji Bhosale (Shivaji's step-brother who was on the Adilshahi side). Also sent to assist the Bijapuris was a contingent from Golkunda. The Bijapur army was initially repulsed by Kirat Singh (son of Jaisingh), Shivaji, Netaji Palkar, Sarfaraz Khan, Salabat Khan and others who were leading the combined Mughal Maratha armies. The forts ceded by Shivaji were Purandar, Rudramal or Vajragad, Kondana, Rohida, Lohagad, Visapur, Tung, Tikona, Khandkala, Mahuli, Muranjan, Kohaj, Karnala, Songad, Palasgad, Bhandargad, Khirdurg, Nardurg, Vasantgad, Nangagad, Ankola or Khaigad, Margagad, and Mangad. Meanwhile, Shivaji was feeling restless and also insecure in the Mughal camp. He feared an attack on his life. It is to be noted that as per the memoirs of Niccoli Mannuci who then was acting as an envoy of Jaisingh, Dilerkhan wished to murder Shivaji, but Jaisingh had strictly prohibited it. So Shivaji requested of Jaisingh that he should be allowed to be detached from the Mughal contingent and sent separately to attack Fort Panhala. Of course, Shivaji's attempts to capture Panhala failed (on 16 January 1666), and he sullenly retreated to his fort at Vishalgad. Therefore, in spite of a victory over the Marathas, Mirza Raje Jaisingh wasn't very successful against the Bijapuris and had to return leaving his Deccan campaign incomplete. Mirza Raje Jaisingh continued in his role as governor of the Deccan and was successful to the extent of extracting a pledge from the Bijapur sultanate, whereby they agreed to pay an annual tribute to the Mughals. After Shivaji's escape from Agra, Jaisingh and his son, Ramsingh, fell from favour with Aurangzeb and were penalised for the losses. Jaisingh was soon recalled from the Deccan and Aurangzeb sent his son, Prince Muazzam, as a replacement along with Raja Jaswant Singh (as his adviser). But before Raja Jaisingh could return to Delhi, he fell ill and died at Burhanpur. Jaisingh had requested that Shivaji meet Emperor Aurangzeb at Agra to discuss the details of his treaty of Purander and was also promised the viceroyalty of the Deccan. Jaisingh even gave his personal word of honour that Shivaji will be protected during his Delhi trip and that he or his men would not be harmed in any way. For his Agra trip sanction was given for a huge payment (100,000 rupees from the Aurangabad treasury) to pay for his military contingents (eight elephants, 500 horsemen and 500 foot soldiers. He was also accompanied by his eldest son, Sambhaji). Shivaji set off for Agra from Fort Rajgadh on 5 March 1666. He was received at Agra by Ramsingh, the son of Mirza Raje Jaisingh, on 12 May 1666, and was soon granted an audience in Aurangzeb's court. But the meeting with the emperor was soon to go awfully wrong. Apparently, in the court Aurangzeb took no notice of Shivaji and Shivaji was made to stand in a row which was meant for the five thousand courtiers. This irked the self-respecting Shivaji to no end. He angrily remarked to Ramsingh that Aurangzeb has insulted him by making him stand behind people whom he has made to flee from the battlefield. Saying this Shivaji and his son walked away from the durbar in a huff. Predictably Shivaji and his men were put under house arrest by Aurangzeb. Ramsingh pleaded mercy on behalf of Shivaji, but his pleas were not heeded. Apparently, Aurangzeb had decided to murder Shivaji for his insolence. A heavily armed unit guarded the house in which Shivaji was lodged, but Shivaji was not a man who could be held in confinement for long. His sharp mind soon devised a plan to escape. Initially he feigned illness. He also spent his time in meditation, as if he had turned into a recluse. He even spread rumours that he wanted to spend his last days as a hermit. Shivaji then started sending huge baskets filled with sweets and eatables for the poor and the holy men of Agra. Initially the baskets were checked, but as the days passed by, the patrols became negligent. After making sure that the men outside had become complacent, Shivaji and his son, Sambhaji, seated themselves in those wooden baskets and escaped from the mansion. Then, entrusting the young Sambhaji to the safety of the house of a confidante Brahmin, Shivaji escaped in disguise from Agra. His daring escape from Agra made him the subject of folklore, to be sung about for centuries to come. Later, Jaisingh couldn't afford to let a valuable asset like Netaji Palkar go to the other side, so he increased his offer to five hazari and once again brought Netaji Palkar to the Mughal side (March 1666). Netaji converted to Islam (and was renamed Muhammed Quli Khan), and was hastened off to an expedition to Afghanistan. It is alluded by many historians that Netaji Palkar switched sides under a secret understanding with Shivaji, and that this was a part of Shivaji's bigger game plan. But there are many opposing this theory who have stated that Netaji deserted Shivaji after a personal fallout. Whatever the truth, Netaji did cross over to the other side. Netaji Palkar was later to be reconverted back to the Hindu fold by Shivaji, after he returned to the Maratha side in 1676. It is interesting to note that Rustam Zaman left Fort Rangna for Shivaji, much to the annoyance of Adilshah, which only goes to prove Shivaji's secret understanding with this Adilshahi commander. Shivaji returned to Rajgadh, reaching there on 20 November 1666. He maintained a low profile for the next three years. 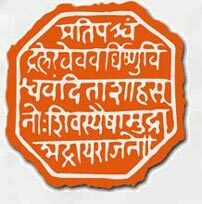 But these three years Shivaji utilised for consolidating his position in Maharashtra. He reorganised his forces, intending to regain his lost territory, mainly at the expense of the Bijapuris, especially around the Goa Konkan strip. He also wanted to attack the Siddi at Janjira, but the Mughals were proving to be the impediment to both operations. But what disturbed Shivaji more was Aurangzeb's Islamic zeal which had showed itself when he started demolishing Hindu temples and indulging in forcible conversions (as related by Pagadi, letter of President Gary of Surat). The Kashi Vishwanath temple at Varanasi was sacked by the Mughals. This offended Shivaji's religious sensibilities. Also, the Mughal empire was facing disturbances from other quarters, especially in Afghanistan and Mathura. Moreover, Aurangzeb was also paranoid about the activities of his son, Prince Muazzam, governor of the Deccan. What's more, things weren't going well in the Mughal camp. Muazzam and Jaswant Singh bore some antipathy towards another Mughal commander, Diler Khan. The Mughals were in disarray. Shivaji had captured almost all the territories near Goa and South Konkan barring Phonda and Jambavali Panchamahal. All the local chieftains (desais) from these areas fled to Portuguese territories and were harboured by the Portuguese. This created tensions between Shivaji and the Portuguese. In retaliation, Shivaji plundered the Portuguese territory of Bardesh (on 22 November 1667). Finally the Portuguese had to enter into a treaty with Shivaji. Kondana was a fort that lay on the outskirts of Pune. 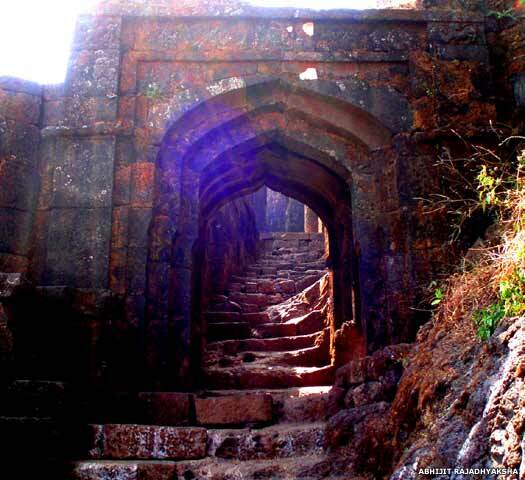 It was one of the forts that had been ceded to the Mughals as per the Purandar treaty. In February 1670, Shivaji sent his trusted commander, Tanaji Malusare, and his brother Suryaji Malusare to take back Kondana. Tanaji even postponed his son's wedding and gave precedence to his duty towards his king. The fort was guarded by a fifteen hundred strong contingent of Rajputs under Udaybhan Rathod. Tanaji and his men climbed the steep mountain slope by hand and fell upon the Mughal guards (legend says that Tanaji used a pet mountain monitor to carry the rope up the steep cliff). But Sabhasad Bakhar, a treatise on Shivaji, contradicts the ghorphad folklore and mentions Tanaji and his mavalas having climbed Kondana like vanars (monkeys) in the dead of night. Udaybhan offered stiff resistance, in the fight that ensued, and both he and Tanaji were killed in the hard fighting. But Suryaji and Shelar Mama, Tanaji's maternal uncle and an old war veteran, carried on the fight and ultimately led the Marathas to victory. On hearing the news of Tanaji's death, Shivaji is said to have exclaimed (as per Sabhasad Bakhar), "Ek gadh aalaa pan ek gadh gelaa." ("One fort was captured, but the other was lost."). A popular novel by Shri H N Apte was entitled Gadh ala pun sinha gela (on similar sounding words) meaning, 'the fort was captured but the lion died'. This has led people to believe that Kondhana was named Sinhagad in memory of Tanaji Malusare who died a lion's death. But some documents uncovered have proved that the Kondana was named Sinhagad years before Tanaji's death. Prince Muazzam was recalled afterwards from the Deccan, and Bahadurkhan was sent as his replacement. Shivaji carries out naval operations against the Siddis of Janjira and the Mughals in 1672. Due to Rustamzaman's friendly overtures to Shivaji, in the middle of 1672 Bijapur takes away Rustamzaman's viceroyalty of the Kanara region and his areas of Raibag and Hukkeri. Rustamzaman rebels against the sultan, but his rebellion is crushed. Shivaji attacks Bijapur territories again. Panhala is taken by Shivaji from Bijapur on 6 March 1673. 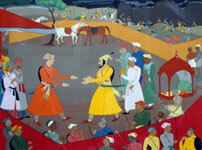 Maratha Sarlashkar Prataprao Gujar engages Bahlol Khan, the Pathan commander of Bijapur, at the Battle of Umrani in March 1673, but the latter is let off. Shivaji is furious with his sarlaskar (commander in chief), but Prataprao is out to restore the shaken faith of his master, and attacks Bijapur territories in Karnatak. Hubli is also attacked. For his failure, Muzzafarkhan, governor of Kanara, is sacked. He rebels against Bijapur. Miansaheb, the fauzdar of Karwar, also rebels against Bijapur. Shivaji captures Parli in April 1673, and Satara on 27 July 1673. Shivaji plunders Bankapur in Dharwar on 10 October 1673. Shivaji beats the forces of Diler Khan, the Mughal commander. Shivaji's Sarlashkar Prataprao Gujar dies at the Battle of Nesari on 24 February 1673. Prataprao is succeeded by Hambirao Mohite as the new sarlashkar on 8 April 1674. Until the death of his father Shahaji, Shivaji had always considered Shahaji to be the Raja. Since Shahaji was always a noble at the courts of the sultans, Shivaji was always viewed as a rebel, an upstart, by his enemies and contemporaries. He was never considered a king in the true sense (in spite of the huge territory he had conquered by over-awing three kings). It had become imperative now that Shivaji should be crowned as a chatrapati ('chatra' here means the royal umbrella and 'pati' is the owner. Hence, chatrapati means the owner of the royal umbrella, ie. the king). The idea of Shivaji being declared a king was first mooted by Gaga Bhat, a learned Brahmin from Benares (whose family had earlier migrated from Paithan). Abdullah Qutubshah of Golkunda died on 21 April 1672. He was succeeded by his son-in-law, Abul Hasan (Tana Shah). Ali Adil Shah of Bijapur died on 24 November 1672. He was succeeded by Sikandar Adil Shah, a boy of four. Khawaskhan, the son of the old prime minister, Khan Muhammed Khankhanan, became the regent. In May 1674, Shivaji began preparations for his coronation. As per the Hindu rites, he remarried his wives (on 30 May), performed the sacred thread ceremony (29 May), officially appointed his own council of ministers, the Ashta Pradhans (eight ministers), distributed gifts to his men, the poor and the Brahmins (14 June). Thus Shivaji was officially crowned king by the Vedic rites. Rajgadh was declared to be the capital of his kingdom. Incidentally, he was crowned king for a second time by Tantrik rites (by a Tantrik priest named Nischalpuri Gosavi), apparently due to some incidents and tragedies that happened just before and after his coronation. In October 1674, the Marathas raid Khandesh. On 17 April 1675 Shivaji captures Phonda from the Bijapuris. By mid-1675 the Marathas occupy Karwar. Kolhapur falls to them in July 1675. The Marathas also have naval skirmishes with the Siddis of Janjira in November 1675. Early 1676, Peshwa Pingale engages Raja of Ramnagar in battle en route to Surat. Shivaji loots Athni in March 1676. By the end of 1676, Shivaji besieges Belgaum and Vayem Rayim. Shivaji embarked on his southern expedition sometime in January 1677. Shivaji knew that the days of Bijapur were numbered, and he wanted to strike the final nail in their coffin with his southern expedition. The idea was to become the immediate successor to the Bijapur sultanate in the south, before the Mughals caught up. Shivaji concluded a treaty with the Golkunda sultan, Abul Hasan (after being received with great pomp in the city of Hyderabad). Shivaji then proceeded to conquer Jinji (in Tamil Nadu) which he did in May 1677. Jinji was to serve as the southern capital of the Marathas for the next twenty-seven years. Lakshmishwar, Belvadi, the central and eastern regions of Mysore, Kopal, Bellary, Chitaldurg and Vellore, also fell to Shivaji. Shivaji had a brief altercation with his step-brother, Vyankoji (who had by now established his rule in Thanjavur in Tamil Nadu). It was a dispute over Shahaji's legacy and estate in Karnatak, but eventually both brothers were able to reach an amicable settlement. All in all, the southern expedition proved very fruitful for Shivaji. Politics in the Bijapur court intensified between rival factions - the Deccan faction led by the regent, Khawaskhan, and the Pathan faction led by the Bahlol Khan - leading to open battles between them. Khawaskhan was put to death by the Pathans on 18 January 1676, and leadership of the Deccan faction was taken over by Siddi Masud. Mughals led by Bahadur Khan sided with the Deccan faction, and clashed with the Pathans in the Battle of Indi on 13 June 1676. The Pathans had to retreat. Sambhaji, the eldest son of Shivaji, was developing a serious level of friction with his step-mother, Soyarabai, who wanted to install her own son, Rajaram, on the Maratha throne. Also, adding fuel to the fire were certain incidents that took place due to Sambhaji's amorous leanings (according to some historians), something of which Shivaji strongly disapproved. The differences between father and son reached a point at which Sambhaji took off to join the Mughals (during Shivaji's southern expedition), sometime in December 1678. But within a year the impetuous prince realised his folly and returned back to the Maratha camp. Shivaji had an brief altercation with the English over the island of Khanderi sometime towards the end of 1679 and the start of 1680. Shivaji's admiral, Daulat Khan, successfully defeated the English in a few naval battles, forcing the English to accept defeat and hasten to agree a treaty with Shivaji. Shivaji was also to start an expedition against the Portuguese to sort out pending disputes, if not for what was an anti-climax to this great king's life. The fatigues of constant wars had taken their toll on Shivaji. He fell ill due to heat strokes and an ailment described as fever and blood dysentery. Shivaji passed away on 3 April 1680. An eventful life was cut short at the age of fifty-three. Diler Khan, the Mughal commander, had laid siege to Bijapur, but was recalled by Aurangzeb after differences arose between him and Prince Muazzam (and Raja Jaswant Singh).